The 617 Squadron war memorial is in on the main street of the little town of Woodhall Spa, on the corner of the road which leads to the site of the wartime RAF station which bore the same name. It is a large concrete monument in the shape of a breached dam wall – the water flooding through the centre represented by a slate slab, which is carved with the squadron crest and battle honours. This is the official memorial to the 53 men from the UK and the Commonwealth who died on the day of the Dams Raid, which took place 74 years ago today. The memorial also lists the 151 other men who served with the squadron and died while on active service later in the war. All are listed in strict alphabetical order: no ranks, just initials, surnames and decorations. The town is popular with tourists and day trippers so a small stream of people walk up to the memorial every day, many looking for the famous names. But few cannot be moved by the sheer number here – 204 died in a period of under two years. We should not forget, however, that their sacrifice is replicated on the countless other memorials across the world to those who died elsewhere in the Second World War. Together, they are a humbling sight. The Reichswald Forest War Cemetery lies in a wooded area in north west Germany, near the town of Kleve and not far from a massive road bridge across the Rhine. It is the largest Commonwealth war cemetery in Germany – the last resting place for 7672 men who fought with the Allied services in the Second World War. Of these, 3915 flew with the various air forces. Amongst these lie 32 Dambusters, making this quiet spot the place on earth where there are the most Dams Raid veterans buried. Twenty-seven of the 53 who died on the Dams Raid itself are now interred here (Bill Astell and his crew, Norman Barlow and his crew, Henry Maudslay and his crew, and Warner Ottley and the six of his crew who were killed). Five more men, all by then flying in the crew of Sqn Ldr George Holden and killed on the fateful Dortmund Ems Canal raid on 17 September 1943, also lie here. The Dambuster graves are in groups in different parts of the cemetery. Seven of them lie together in one row, not far from the edge. This is the crew of AJ-E: Norman Barlow, pilot; Leslie Whillis, flight engineer; Philip Burgess, navigator; Charlie Williams, wireless operator; Alan Gillespie, bomb aimer; Harvey Glinz, front gunner and Jack Liddell, rear gunner. And on 18 May this year it was at their graves that we first paid our respects, coming as we had from the unveiling of a new memorial at their crash site near Haldern, about 30km away. This was an experienced crew, all of whom had served together in 61 Squadron at RAF Syerston. Three were in their 30s, and six had been commissioned as officers. Unfortunately all this experience came to nought when their aircraft, targeted with an attack on the Sorpe Dam, collided with a high tension electric pylon on the edge of a small wood, and crashed in flames. They were all killed instantly and their bodies were then taken to Dusseldorf North cemetery for burial. After the war, like many other Allied aircrew from other parts of Germany, their remains were exhumed and reinterred in Reichswald Forest. Although the gravestones were all produced to a standardised format, the Commonwealth War Graves Commission allowed each family to choose a quotation or dedication to appear at the foot of the stone. Not all took this opportunity but when they did, it’s their words which frequently produce the lump-in-throat moment as you walk between the lines of stones. The AJ-E men each have something added. Harvey Glinz’s stone has the simplest dedication: “Always remembered”. Leslie Whillis and Philip Burgess have similar quotations. “Greater love hath no man than this, that a man lay down his life for his friends” is the usually quoted version which appears in the King James Bible version of St John’s Gospel. This appears on Burgess’s stone, while Whillis’s has the variation: “Greater love hath no man than this, he gave his life for his friends.” Charlie Williams’s grave bears words which seem to encapsulate the emotions his family must have felt by the death in a faraway cold land of a country boy from an Australian sheep farm: “He gallantly died renouncing all the things that he loved”. The age of the youngest man to take part in the Dams Raid, Jack Liddell, is alluded to by his family: “ In the prime of his youth he died that we might live”. Norman Barlow, the only one to be both a husband and a father, is remembered for the former achievement, if not the latter: “ In loving memory of my husband who gave all for his country”. And Alan Gillespie’s stone reads: “At the going down of the sun and in the morning we will remember them”. 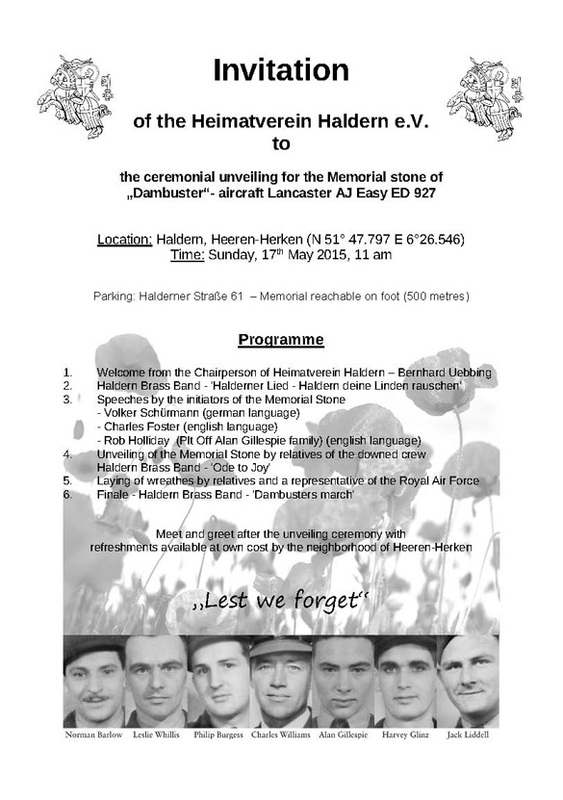 Several hundred people are now expected to attend the unveiling of the memorial to the Dams Raid crew of Lancaster AJ-E, scheduled for 1100 local time on Sunday 17 May at Haldern, near Rees in Germany. Above, you can see the memorial stone and foundation being installed. It is an impressive piece of work, and we are all much indebted to the local people and traders who have worked so hard to bring the project to fruition. 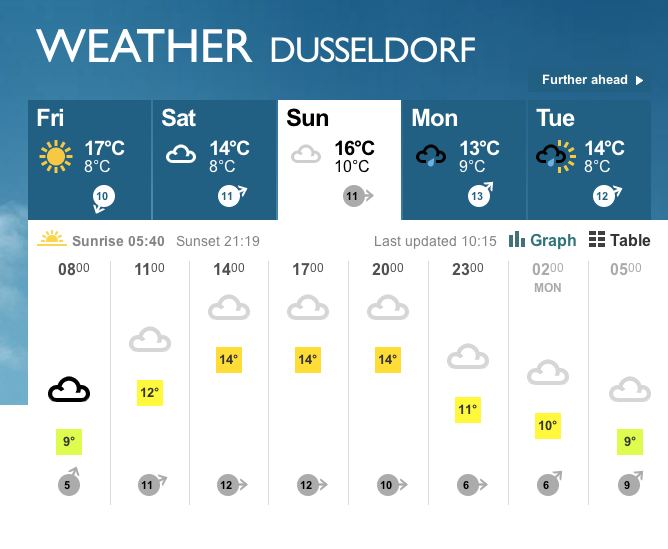 The good news is that the weather is expected to remain dry, although with a maximum temperature of 16ºC a jacket is probably advisable. Please also note that there will be no parking at the site itself, except for those needing disabled access. Parking will be available approximately 500m away, so be prepared to walk. If you are visiting the area for the first time, you might also like to know that Reichswald Forest War Cemetery is about 40km away. This is the last resting place of the crew of AJ-E, captained by Norman Barlow, and three other Dams Raid crews – those captained by Henry Maudslay (AJ-Z), Bill Astell (AJ-B) and Bill Ottley (AJ-C). Finally, if you are there on Sunday and are a reader of Dambusters Blog, come over and say hello. And spread the word to your friends and acquaintances! In Germany, work is progressing fast to build the memorial to the Dams Raid crew of Lancaster AJ-E in time for its unveiling on 17 May. 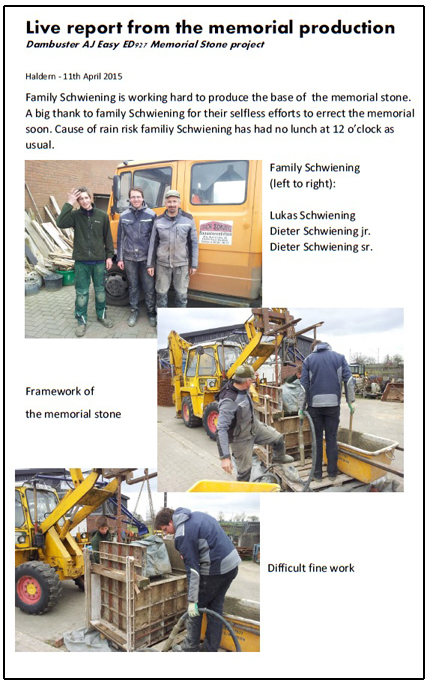 Here we can see the memorial stone being worked on in the Schweining family business. As you can see, it will be a substantial piece of work, and a fitting tribute. We are very pleased to announce that the details for the unveiling of the memorial to the Dams Raid crew of Lancaster AJ-E have now been finalised. Regular readers of this blog will know that a memorial stone and plaque are to be erected at the site in Germany where this aircraft crashed at 23.50 on Sunday 16 May 1943. The crew of seven, captained by Flt Lt Norman Barlow DFC, were all killed. 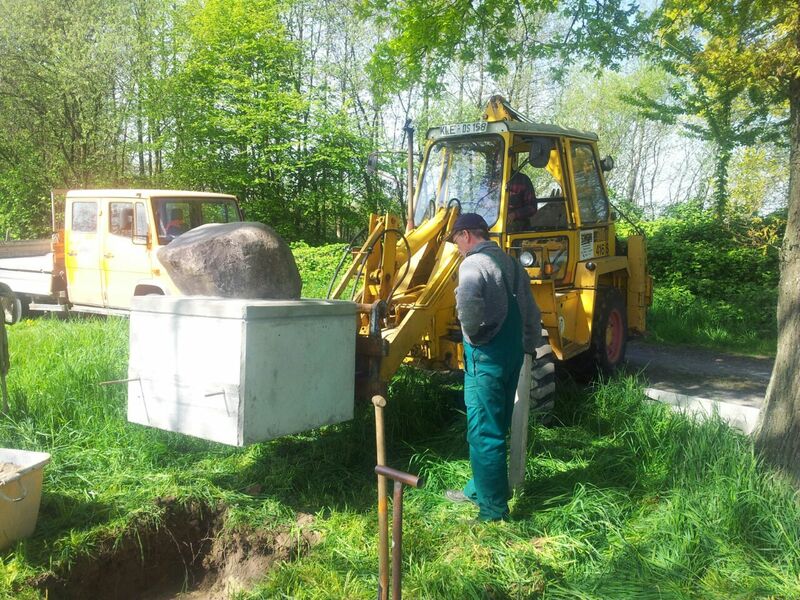 The unveiling will take place at 11.00am local time on Sunday 17 May 2015, the 72nd anniversary of the Dams Raid, at Heeren-Herken, near Haldern. The memorial has been organised by local historian Volker Schürmann and the Haldern local history society, Heimatverein Haldern. The money to pay for the memorial stone and the plaque was raised by public appeal, and many readers of this blog were generous in making contributions. The speakers will be Volker Schürmann, Charles Foster and Rob Holliday, a member of the family of Plt Off Alan Gillespie DFM, representing the families. Wreathes will be laid by the families and a representative of the RAF. All are welcome at the event.